We’ll be popping up at Victoria Park Village this Christmas. Come and visit us there if you are in London Town. Come and check out some of the best creative gifts in Shoreditch from 10th till 18th December 2016. From London based designers, we have come together to offer you the best shopping experience. Not to mention, we will be hosting an opening event on Saturday night! See you there! To celebrate the final weekend of The London Design Festival 2016, South East Makers Club invites all design enthusiasts to head south and follow our trail through the creative streets and studios of South East London. The journey begins at the Job Centre bar in Deptford where visitors will be requested to “sign up” to become a member of the club (a club open to anyone with a passion for craft, design, materials, making and South East London). Issued with a club card and trail map, members will then experience design through an interactive, sensory journey spanning Deptford, Brockley, New Cross, and Peckham. The trail includes a host of workshops, exhibitions, public art installations, films and even a designer pub quiz hosted by our media partners, South East London Journal. Along the way, visitors will find an array of work by local designers including a ceramics exhibition ‘Clay Mechanics’ at Simple Shape, a bold, collaborative installation by Alice Made This, and ‘Words & Workshops’ at the Art House to name just a few. Come and join Kuku Big Bag on Saturday 24th September at The Lewisham Arts House for a one off mini leathercrafts workshop at 3:30pm. A private event for the Heal's Stylist workshop, giving the chance for stylists to get their hands on some traditional leatherwork. Starting with drinks and nibbles, they will go on to make their own leather purse and personalise it! If your new years res is to learn a new skill then what better way to start than with a leatherwork workshop? Get stuck in with the ole’ fashioned methods of saddle stitching and burnishing after picking your own colour, thread and design with Kuku Big Bag. Then limber up those fingers with a glass of wine to make a handcrafted purse you definitely can’t get on the high street. Coming to your live from Heal's, Tottenham Court Road this X'mas! 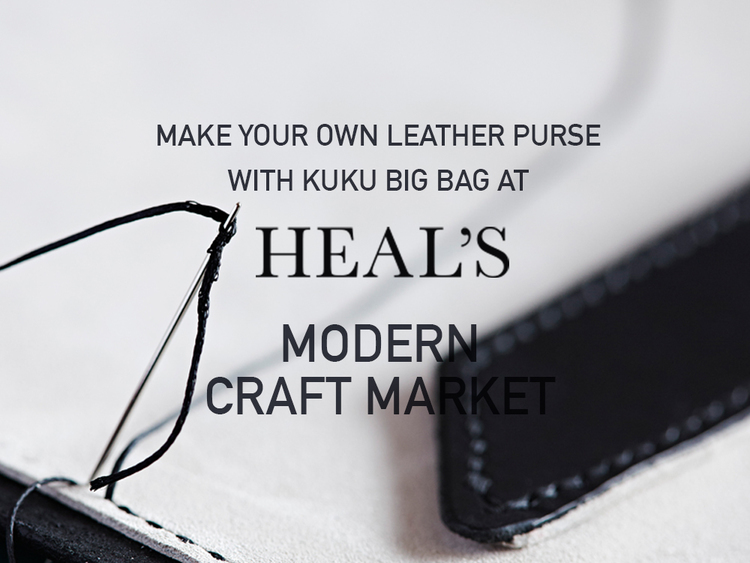 We will be there from Thursday to Sunday from next week on until X'mas for live leatherwork demonstration and a special 'Design Your Own' leather purse/cardholder. Come and get your personalised Kuku Big Bag now! Kuku Big Bag Pop-up at Craft Central, 33 St. John's square, EC1M4DS will be opened from 8th September till 13th September. Come inside the workshop of leather craftswoman, Candice Lau and watch turn hide to handbag. Throughout the week, she will demonstrate how to make handbags from her collection, and an exclusive 'pimp my bike' session where she will create a bespoke saddle and leather handle bars. On Thursday 10th September, join us for an evening of wine and nibbles for a special VIP event from 6:30pm till 9pm. To celebrate, we are having a free leathercraft taster course and an exclusive 10% off all our leather bags for one night only. To join us, RSVP here http://bit.ly/1N9FVBC.